Think fresh sheets of pasta spiraled like a cinnamon bun, but layered with bechamel sauce, cheese, and ham (and a pinch of nutmeg). Then the whole shebang is baked on a bed of more bechamel sauce, under a sprinkling of Parmesan, for an ultra creamy casserole. Start by making the homemade pasta. Set it aside to rest for 20 minutes. Meanwhile, make the bechamel: melt the butter in a pot. Whisk in the flour and nutmeg until completely combined, then whisk together with a little milk. Keep adding milk a little at a time until a smooth, thick sauce forms. Set aside. 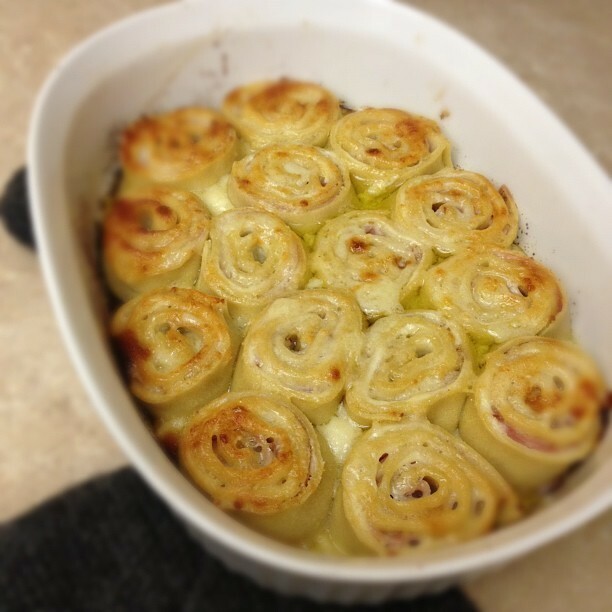 Top with half the bechamel sauce… then ham, then cheese. Tip – use really thin slices of cheese…have the deli counter slice it for you. Then roll up into a long tube. Freeze for about 30 minutes (this will make it so easy to slice). If you need to slice it in half to fit in your freezer, go for it. Preheat the oven to 170 and oil a casserole liberally. Spoon in the remaining half of the bechamel sauce. Remove the pasta roll from the freezer and slice to make individual nests. The best way to make them equal sized is to slice the roll in half, then half again, and so on. (mine ended up being about 1 1/2 inches high). TIP: The less Parmesan you add to the spirals, the easier it will be to see their lovely design.